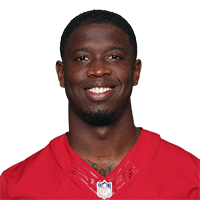 Published: Oct. 28, 2018 at 05:36 p.m.
San Francisco 49ers safety Jaquiski Tartt intercepts Arizona Cardinals quarterback Josh Rosen for a 23-yard interception return. Published: Dec. 13, 2015 at 11:38 p.m.
Cleveland Browns quarterback Johnny Manziel is intercepted by San Francisco 49ers safety Jaquiski Tartt. Published: Dec. 13, 2015 at 11:05 p.m.
After throwing an interception in the second quarter against the 49ers on Sunday, Browns quarterback Johnny Manziel took out some of his frustration on his tablet on the sidelines. Published: Nov. 1, 2015 at 01:53 p.m.
St. Louis Rams wide receiver Tavon Austin fumbled the football after a 24-yard catch. San Francisco 49ers linebacker Eli Harold recovered the ball.